The self-paced Advanced Spare Parts Management Training Program equips you with the know-how and skills to effectively manage all aspects of spare parts inventory. This self-paced program covers all of the issues faced during the spare parts inventory life-cycle. Undertaking the self-paced Advanced Spare Parts Management Training Program will ensure that you develop the skills, know-how, policies, and systems to minimize your spare parts investment while maximizing your spare parts availability. How to proactively manage stock levels through pre-stocking analysis, joint planning, ensuring accuracy, and timely recognition and management of obsolescence. How to continuously optimize your spare parts stock levels based on real-world information, targeted reviews and the refinement of processes. How to ensure that you manage all aspects of your spare parts inventory using a comprehensive set of written and fully implemented policies and related procedures. How to utilize, and formally report, a set of standardized performance measures. How to manage your storeroom effectively through controlling access, standardizing descriptions, applying visual management, controlling transactions, maintaining parts to be fit for use, and integrating with procurement. How to effectively and efficiently manage both the human and project management aspects of identifying, executing and implementing improvements. 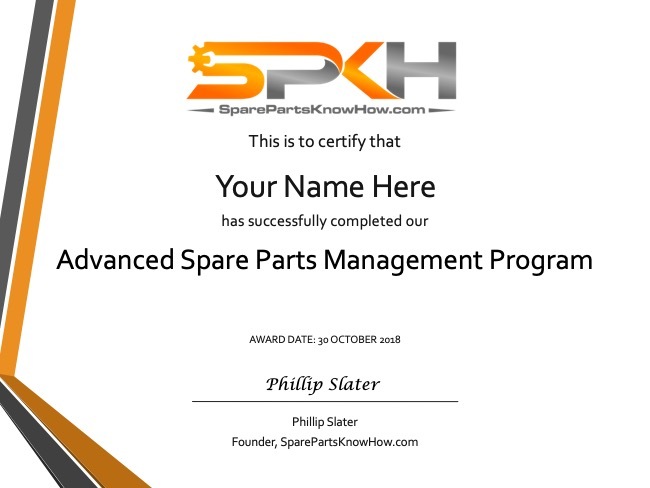 The self-paced Advanced Spare Parts Management Training Program is designed for those people engaged in the oversight of spare parts inventory management and decision-making. This includes managers, supervisors, storeroom personnel, procurement team leaders, planners, and maintenance personnel. Completing the program will give you the confidence to develop a comprehensive approach for the management of spare parts throughout their entire life-cycle. The self-paced Advanced Spare Parts Management Training Program allows you to study at your own pace and you have up to 6 months to complete all the modules. Each module includes an online quiz. Successfully completing all of the online quizzes leads to the award of our Advanced Spare Parts Management Certificate. We set the ‘pass’ level for these quizzes at 80%.